Well, we're all still here: the year 2012 didn't see the world end, thankfully. And it's just as well -- it's been a brilliant year for music (according to SPB's review data, it's been a return to form after a mildly disappointing 2011). 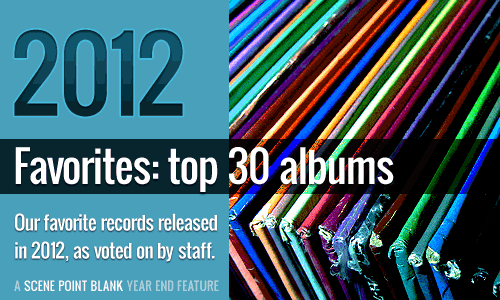 In this roundup of our favorite albums of 2012, we leave no stone (or genre) unturned in our quest to bring you the greatest original releases (no reissues, compilations or EPs here) from the previous year. A note on production: SPB's top album list is decided on by staff who submit individual lists, which are then automatically number-crunched into this; one list to rule them all. You can see these source lists on the third page of this feature. 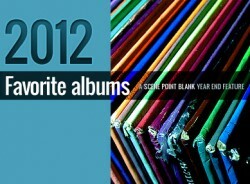 Without further ado, here begins Scene Point Blank's top 30 albums of 2012! Words by the SPB team on Jan. 12, 2013, 7:02 a.m.
Posted on Jan. 12, 2013, 7:02 a.m.